I offered a gentleman a cookie today at work and he said, "Oh no, if I have one, it will be down hill for me every time you serve cookies. There should be a group called Cookie addicts Anonymous!" That made me laugh, but I totally understand his philosophy. I could attend a C.A.A. group occasionally myself. Hmmm, but what would we have with our coffee at group? That is a cookie conundrum! Here is the recipe for the cookies I baked off today. Cream butter and sugars together in or with a mixer. Add eggs and vanilla and beat until fluffy. Add dry ingredients to butter mixture. Stir in oatmeal, chips, nuts and mix well. Form into uniform pieces with a cookie scoop, place evenly on a cookie sheet lined with parchment paper. 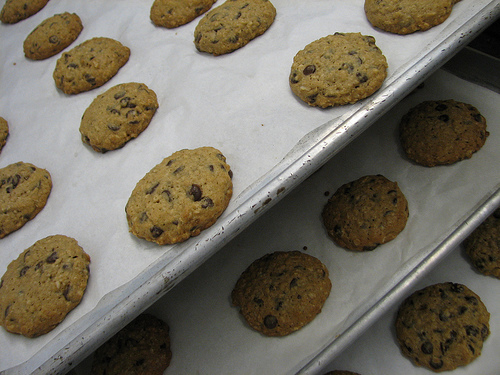 Press down for uniformity onto cookie sheet and bake at 350 degrees for 12-14 minutes, or until golden. Makes about 4 dozen, 3-inch in size cookies. This entry was posted in Uncategorized and tagged bake, but there is oatmeal in it, chef@isimmer.com, chocolate, cook, cookies, easy cookie recipe, flickr, isimmer.com, oatmeal, oatmeal chocolate chip cookies, snatchables, Susan Beach, sweets. Bookmark the permalink.